1. Preheat the oven to 180°C, gas mark 4. Grease and base line 2 x 20cm sandwich tins. 2. Grate the carrot finely then put into a clean tea towel or kitchen paper and squeeze out as much moisture as possible. Put the carrot into a mixing bowl along with the other ingredients for the cake and beat to a smooth batter – this is even easier in a freestanding electric mixer with paddle attachment. 3. Divide the batter between the prepared cake tins, evenly, and bake in the preheated oven for 30-35 minutes, or until a skewer inserted into the centre comes out clean. Remove the cakes from the oven and allow to cool in the tins for five minutes, then turn out onto a wire rack to finish cooling. 4. For the frosting, sift the icing sugar into a mixing bowl and add the butter. Carefully beat together – this will take a while to come together, but patience and care will see it done. The mixture will still be fairly dry and stiff. Add the cream cheese and zest and beat until fluffy – a minute or so will do it. 5. To assemble, take one layer of cake and place it onto a cake stand or plate. Pile on half of the cream cheese frosting and spread it evenly with the palette knife. Top with the second cake and repeat. 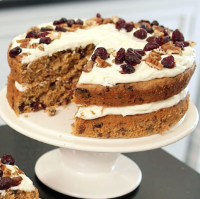 To finish the cake, scatter over the cranberries and chopped pecans. This recipe was first published in Mon Oct 05 13:19:20 BST 2015.